These healthy chocolate date balls are vegan, gluten free and very easy to make. These no bake energy balls are a great healthy snack for busy days! Raw chocolate date balls, also known as no bake energy balls are my newest OBSESSION! Now that my little one is an active toddler, I need to keep my ENERGY levels up and thankfully, my friends introduced me to energy balls. These RAW energy balls for chocolate lovers are a dream come true… So FUDGY and delicious! 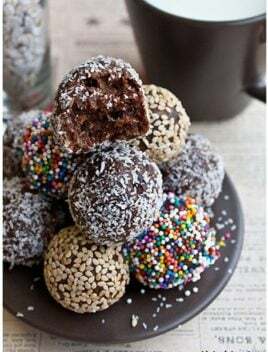 I like to roll these vegan, gluten-free chocolate coconut date balls in all sorts of things like sprinkles, toasted sesame seeds… just to add that extra OOMPH! My FAVORITE are the coconut covered balls BUT my little one is quite fond of the sprinkle ones…heheh. Are energy balls good for you? Are energy balls healthy? How healthy are energy balls? Yes, they are good for you since they are made with good wholesome ingredients that make your body stronger. My energy balls recipe is made with dates, coconut, cocoa powder, and nuts. However, you can modify this energy balls recipe to suit your own needs by adding protein powder, flax seed, sunflower seeds, quinoa, granola, oats and even some almond butter or coconut oil. By the way, I also have a chocolate peanut butter cranberry energy balls recipe that’s perfect for peanut butter lovers and also good for you! Are energy balls gluten free? Yes, as long as you DON’T use any flour or wheat in your recipe. Also, remember to use certified gluten free oats. There are various recipes for energy balls or energy bites. Pretty much, all of them are very easy to make and simply require you to dump all the ingredients in a food processor and make a thick mixture and then roll it into small balls. That’s it! How to store energy balls? Can I freeze energy balls? Store leftovers in a sealed airtight container in the fridge. You can even place them in an airtight container and freeze them up to 1 month. Toddlers and kids of any age LOVE these raw energy bites and can’t even tell they are healthy, making it perfect for a snack or breakfast on the go! These energy bites have no artificial sugars, which makes it a great snack or dessert for diabetics and those who are going through weight loss (obviously, moderation is key!). Energy balls are perfect for athletes like runners and others who enjoy hiking and active sports. They even keep you energized during pregnancy or when you are breastfeeding. These healthy chocolate date balls are vegan, gluten-free and very easy to make. These no-bake energy balls are a great healthy snack for busy days! Add all ingredients in a food processor and mix until everything is thoroughly crushed and combined. Then, roll them around in whatever you like (sprinkles, toasted sesame seeds or shredded coconut). And you are done! Eat as many as you like and store leftovers in airtight container in the fridge. You can also omit cocoa powder completely if you prefer a more "nutty/datey" flavor. Depending on the quality of your dates, you might end up with a dry mixture. To fix that, you will need to add some milk or water (whichever you prefer). That will make the mixture softer and easy for you to make ball shapes. It's easier to make balls if you wear disposable plastic gloves or if you dampen your hands slightly. How many are in a serving, just one? No, you will get about 15 balls, depending on how small or big you roll them. I just made and I was very pleased. The addition that I made was to add a few drizzle of honey to satisfy my sweet tooth? I will sure make again…and again. Thank you!